I would like to draw your attention to an urgent environmental crisis unfolding in North West of Iran with national, regional and global consequences. Lake Oroumieh, the world’s third largest salt lake and a UNESCO Biosphere Reserve, is drying up at an alarming rate due to drought, misguided irrigation policies, development and the irresponsible damming of rivers that feed it. The “wise use” concept at the heart of Ramsar Convention is the conservation and sustainable use of wetlands and their resources, for the benefit of humankind. 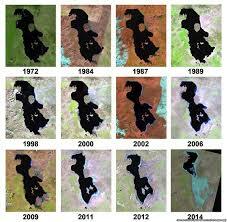 However, in Iran today there are threats of serious and irreversible damage to Lake Oroumieh, with no real measures to prevent the human and environmental degradation. Since early 1990s decision makers have not been accountable for policies that have created the present day crisis. In the recent months environmental activists and ordinary members of public who have protested against these erroneous policies have been arrested and detained in an effort to silence the protest. Arrests of over 300 people in the last few days is quickly turning an environmental issue into a human rights crisis whereby the right to peaceful protest is violated and individuals are arrested and detained arbitrarily. Your Excellency, it is of utmost importance that the international community hears of the looming catastrophe that could result in a ‘salt tsunami’ far exceeding the borders of Iran and affecting not just the lives and livelihood of people around Lake Oroumieh’s catchment area but millions of people in the region. ACI asks that an investigative group visits the region urgently and action is taken to prevent a human and environmental catastrophe.